The Route 57 Corridor Plan was started in 2005 to examine various alternatives that would preserve the rural nature of Route 57 from Phillipsburg to Hackettstown, one of the last remaining state highways with a rustic character. The 18-month planning effort examined future development and transportation alternatives for the twenty-mile, two-lane rural roadway through Warren County. The study built upon related efforts to promote a smart growth and context sensitive approach to future development along the corridor. The outcome of the plan was a recommended development scenario for the region that would focus growth in and around existing urban centers, protecting agricultural land and views between the centers, while minimizing points of congestion along the corridor. This scenario also conserves an estimated 7,000 acres of land. The Route 57 Corridor Plan was developed through a collaborative planning process that engaged key stakeholders, technical experts and community residents alike. The Plan identified innovative implementation measures such as municipal zoning to support smart growth development, integrated land use and transportation planning, improved street connectivity, calming of excessive traffic speeds and targeted spot transportation improvements to mitigate future traffic congestion. In addition, four conceptual prototypes were designed to provide the study communities with a better understanding of potential issues that are common to the corridor. This subset of demonstration plans includes the planning contexts of village/farm preservation, borough/township, transitional areas, small villages and the unique challenges for each context outlined in further detail. 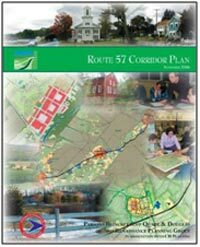 The Route 57 Implementation Toolkit was developed as a companion document to the Corridor Plan. The toolkit provides detailed information and resources, including suggested design guidelines and regulatory measures that municipalities can use to help implement the corridor plan. The Route 57 Corridor Plan and Implementation Toolkit were completed in 2006. The New Jersey Department of Transportation designated the Route 57 corridor as a New Jersey Scenic Byway in February 2009. A corridor management plan is currently being prepared. The Route 57 Corridor Plan resulted in designating Route 57 as a New Jersey Scenic Byway.